Tiramisu is one of my favourite desserts but I try not to indulge in it too often as it's not exactly figure friendly. However I do have a low(ish) fat recipe that I use from time to time whenever I feel like tiramisu but don't want the calories of the full fat version. I made this last weekend for mother's day and it was a hit with everyone. Pour the marsala/brandy and the freshly brewed coffee into a shallow dish and set aside. With electric mixer beat the egg whites with the sugar until firm peaks form. In a separate bowl beat the Marscapone and Ricotta cheeses until smooth, then fold the egg white mixture into it. Dip the savoiardi biscuits, one at a time, in the coffee and lay them down on the bottom of a ceramic serving dish (20cm) in a single layer. Cover the biscuits with half the mixture, then add another layer of coffee soaked biscuits. Pour the remaining mixture over this layer, then wrap in cling wrap and refrigerate for 2 hours (or overnight). I prefer making this the night before as the cream cheese mixture really soaks into the biscuits making them super soft and yummy. Sprinkle with cocoa powder just before serving and enjoy! Tirramisu is one of my favourite deserts! I use ricotta too, but no egg whites, and usually way to much alcohol (I like to use frangellico). I love how quick it can be to make. Thank you for this! 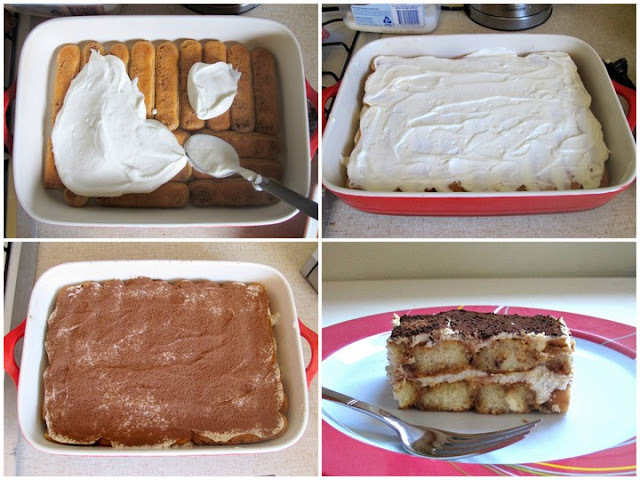 I've been looking for a simple tiramisu recipe for ages now, best dessert of all time!